Description: Ian Kershaw's biography of Adolf Hitler is widely regarded as the definitive work on the subject, as well as one of the most brilliant biographies of our time. In Making Friends with Hitler, the great scholar shines remarkable new light on decisions that led to war by tracing the extraordinary story of Lord Londonderry - one of Britain's wealthiest aristocrats, cousin of Winston Churchill, confidant of the king, and the only British cabinet member to outwardly support the Nazi party. 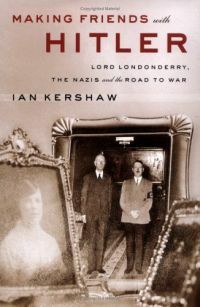 Through Londonderry's tragic tale, Kershaw shows us that behind the accepted dogma of English appeasement and German bullying is a much more complicated and interesting reality - full of miscalculations on both sides that proved to be among the most fateful in history.